Don’t you wonder why some people never seem to get sick and others seem to pick up every bug? Did you know that a seasonal diet actually has immune boosting properties for each season? Who knew? Many of us get into a rut with the food we buy, even resorting to processed or frozen foods that lack important immunity-boosting vitamins and minerals. Fall and winter are orange season – think orange fruits and especially veggies like squash, carrots, sweet potatoes, corn, orange and yellow peppers, yellow beets and pumpkins. These bright-colored fruits and vegetables contain zeaxanthin, flavonoids, lycopene, potassium, vitamin C and beta-carotene (Vitamin A ) – all of which boost your immune system, including in your sinuses and gut wall. This is also amazing: some researchers found that 2,000 iu of Vitamin D a day abolished influenza. It’s best to get Vitamin D from the sun, but if you live north of the equator, like we do, you probably aren’t getting enough Vitamin D. You need it for fighting colds and the flu, and yet many people’s Vitamin D levels are way too low – especially during the winter when the shorter days mean less exposure to Vitamin D from the sunshine. Here’s a surprise: research has shown that sleeping for less than 5 hours a night equals a 5-fold increased risk of catching a cold or flu. That’s serious. A big reason why lots of us don’t get enough sleep is that we drink too much coffee, making it hard for our bodies to unwind for sleep. So, if you’re going to drink coffee, limit to one cup per day and drink before noon. Start weaning off of coffee during a long weekend because it’ll take awhile for your body to adjust. Then, if you still need a pick-me-up during the day, get outside and go for a walk, do some deep breathing exercises, jumping jacks, or try splashing cold water on your face. If you are still struggling with energy, it might be time to have your Nutritionist run some blood work to look for other causes. Eating or drinking too much sugar curbs immune system cells that attack bacteria. This effect lasts for at least a few hours after downing a couple of sugary drinks. So switch to water as your beverage and eat fruit for dessert. Scientists aren’t sure exactly why exercise helps boost your immune system, but they do know that physical activity may help flush bacteria out of the lungs and airways, which may reduce your chance of getting a cold, flu, or other illness. Exercise also causes changes in antibodies and white blood cells – the body’s immune system cells that fight disease, and exercise slows the release of stress hormones. Lower stress hormones may protect against illness. No need to stress over this – a simple daily walk is fine. Ready to get healthy? Try this simple, super-healthy immune boosting soup recipe. It’s called Healing Carrot Soup with Tumeric and Ginger, from Hello Glow. Turmeric is a strong anti-inflammatory and antioxidant spice, stimulating the immune system and circulation. Ginger soothes the intestines and supports healthy digestion. 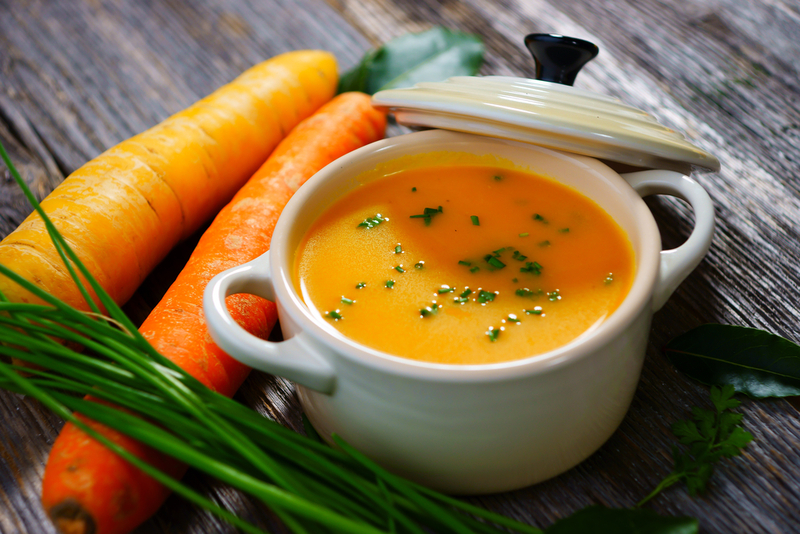 A drizzle of virgin coconut oil improves the absorption of the high concentrations of beta-carotene from the carrots and the curcuma antioxidants in turmeric.